Weight Lifting Belts, Power Lifting Belts, Boxing MItts, Accessories, Grappling/MMA Gloves, Martial Arts Equipments, Karate/Taekwondo Uniforms/Belts ETC. We are leading Manufactures, Exporters and Importers of Leather Weight Lifting Gloves, Belts and Martial Arts Equipments throughout the world. Research, development and the most important factor experience of 25 years are the history of Mr. Belt. We do undertake the manufacturing of our quality products from the best of Leathers, hardware and the raw materials for the entire satisfaction of our valued client bearing in mind the technicalities. Latest Designs & styles of Boxing Gloves are available. 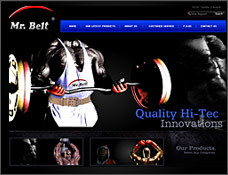 Mr. Belt is speciallized in Manufacturing of Exercise Belts. Grapping fine quality Mixed Martial Arts Gloves. A great range of martial arts equipments. Taekwondo Gloves in new designs and Foot Protectors. Top Quality Judo Uniforms and all kinds of Judo belts. Best Collection of Karate and Taekwondo Uniforms and Belts. We provide high quality of Training Belts. We offer a wide range of Power Lifting Belts for professionals. To make your exercise easy & for your strength we provide a variety of Power & Lever Benches. Mr.Belts is well known in sports market for Exercise Aerobics. We can prvide all kinds of Neoprene/Power/Dip Belts. Mr. Belt is on top in the list of manufacturers of Neoprene Pulling Anklet/Sling. Address: P.O Box # 35 , 569 - C Abbot Road, Sialkot-Pakistan. Copyright © 2009-2010 Mr. Belt. All rights reserved.